To be honest, this is my first time try on face cleansing brush as I use to cleanse my face using normal water. Is not to late for me to explore the latest beauty gadget. 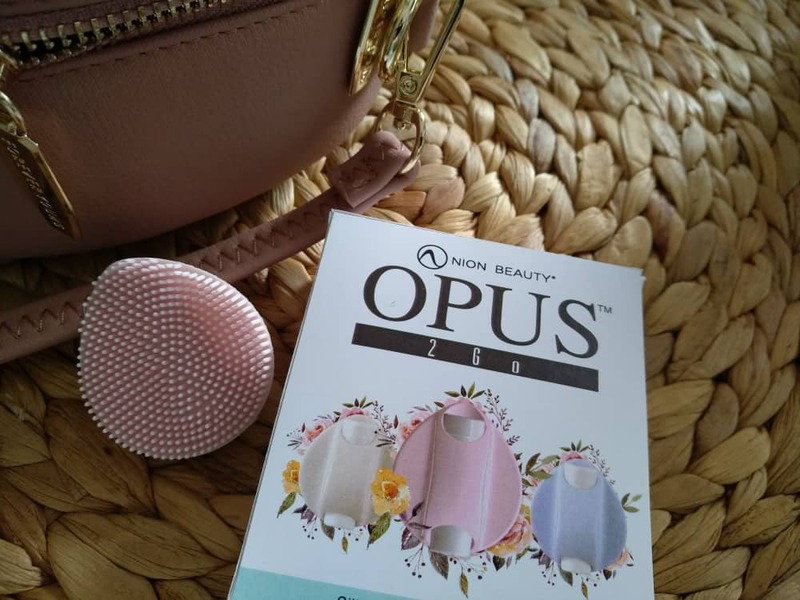 Opus Express is my first beauty gadget that bring a new life to my skin. For a first timer like me, Opus Express and Opus 2Go definitely fit my beauty requirement. Opus Express is a product by Nion Beauty. NION BEAUTY is providing skin care cleansing device in USA based company developed by team of from USA & Korea which combining Japan cutting –edge technology. NION BEAUTY Cleansing Device is comes with Kinectic Skin Cleansing and S-ION Technology which make our brand more different with others brands. Our Kinetic Skin Cleansing System uses vibrational energy to delicately break-up and whisk away impurities. It is using gentle vibration mechanism to remove dirt, pollutants, impurities without stripping the face of its moisture. S-ION Technology is referring to mix of rubber silicone and tourmaline which can generate negative ions to benefit our skin. Negative ions work like tiny magnets that attach to positive charged environmental toxins (dirt) on the skin, creating a heavier element which gets rinsed away easily. Opus 2Go is disposable silicone facial brush and perfect for jet-setters. Come in small size whereby Opus 2Go is a must product for travel. Opus 2Go using S-Ion Technology that remove dirt, impurities and toxin from skin. It comes in 3 units per pack and disposable. Opus 2Go can last for 20 days use. You can choose from 3 different colors ( White, Pink and blue). Opus 2Go made with FDA approved body-safe silicone, water resistant and free from harmful chemicals. Come with internal cell battery that can last for 10 days. Opus 2Go easily to clean and the teardrop shape is easy to use. How to use Opus 2Go? Step 1: Wet your face and apply on your favorite cleanser. Step 3: Gently guide your opus in circular motion for 3 minutes. Opus Express is handy and ideal beauty tool whereby using S-ion Technology that benefit our skin. The negative ion attach to positive charged environmental toxins on the skin, creating a heavier element which get rinsed away easily and leaving my skin fresh and moisture. Worth to highlight in this post is Opus Express's silicone is from Japan and is more durable compare to rubber. Silicone is more gentle to our skin and at the same time resistant to fungus and chemicals. Opus Express using Kinetic Skin Cleansing action whereby a deep vibration that able remove dirt, impurities and at the same time retain skin natural moisture. ↠Opus Express come in 3-Speed Kinetic Skin Cleansing vibration. ↠Easily to wash as you can rinse it with tap water. ↠Handy and easily to bring during travel. ↠Safe to be use during shower. Step1 : Remove the cap and insert 2 AA batteries. Step 5: Gently glide your Opus Express in circular motion for 1-1.5 minutes. This is my first time using Opus Express and surprisingly the bristles is soft and gentle. It works on stubborn blackhead and remove the dead skin. I love the light massage from the bristles. Opus Express easy to handle as you can choose the speed that you want. On the first week, I will go with high speed as my skin is rough and dry. When my skin texture getting better, I will choose medium and low speed. Opus Express is perfect to remove dirt or impurities that clog my pores. Opus Express easy to use and my skin feel more softer after using it. Once done, clean the bristles with tap water and let it dry. Opus Express comes with a small pouch that you bring with you during travel. Opus 2Go is able reach every contour of my face. Love the soft silicone that does not harm my skin. Opus 2Go is a perfect beauty companion during travel. With one switch, I able operate my opus 2Go and it can last me for more that 1 weeks. Where to purchase Opus Express and Opus 2Go?